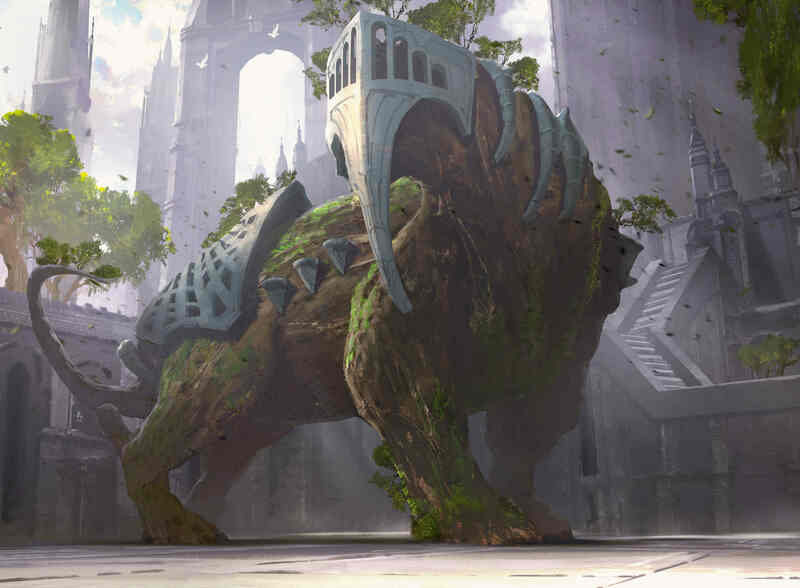 Magic: The Gathering is getting ready for a massive shakeup in October. In less than a month standard (read: the most popular competitive mode) is cycling out a whopping five sets (Kaladesh, Aether Revolt, Amonkhet, Hour of Devastation, and the 2017 Welcome Deck) and cycling in Guilds of Ravnica along with Ixalan, Rivals of Ixalan, Dominaria, and Core 2019. Cards are going away and new ones are coming in, and we have two exclusive cards to show off today that represent the Selesnya Conclave guild. First up is Arboretum Elemental from artist James Paick. It's a 7/5 green elemental creature that holds a massive nine total mana cost, but it's assisted by the convoke keyword: originated by Richard Garfield, and making a return in the Guilds set. In short it allows you to tap creatures to pay for one of the costs (one colorless or one of the creature's color, in this case green). In creature-heavy decks (possibly Saprolings) I can see this ramping up pretty quickly. The other card is Sumala Woodshaper with art from Sara Winters. It's a four cost 2/1 elf druid creature that allows you to look at the top four cards of your library, then reveal a creature or enchantment and put it into your hand. It seems high-costed but with so many cards cycling out, card tutoring options are always welcome. Guilds of Ravnica will cycle in on October 5, when all of the other aforementioned sets are cycling out. In 2019 another Ravnica-themed set, Allegiance, is due.